The factory-installed prep package for the 2014 F-150 -- designed to operate on either natural gas or regular gasoline using separate fuel systems -- will cost $315, Ford says. DETROIT -- Ford Motor Co. will offer the 2014 F-150 with an equipment package that allows the popular pickup to run on compressed natural gas or liquid propane gas. The option will be available on F-150s powered by Ford's 3.7-liter V-6 engine. The factory-installed prep package includes hardened valves, valve seats, pistons and rings designed to operate on either natural gas or regular gasoline using separate fuel systems, Ford said today. The package, available when the 2014 F-150 debuts this fall, will cost $315. "Businesses and fleet customers have been asking Ford to make F-150 available with CNG capability to take advantage of the fuel's low price and clean emissions," Jon Coleman, Ford fleet sustainability and technology manager, said in a statement. "With the money saved using CNG, customers could start to see payback on their investment in as little as 24 to 36 months." 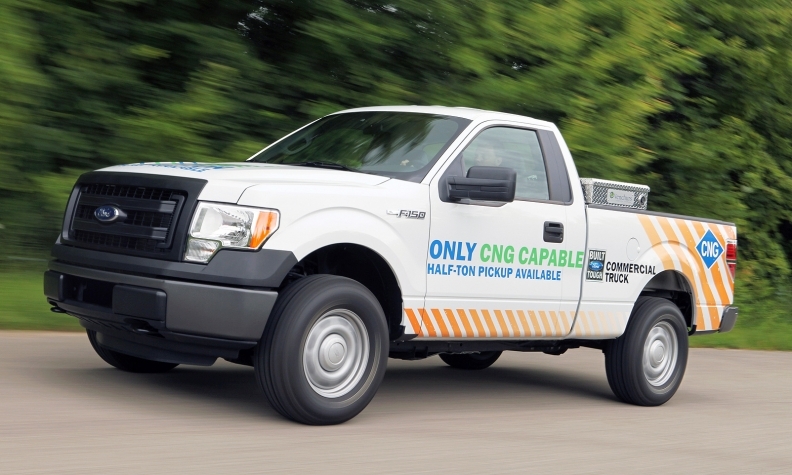 Ford works with six upfitters, known as "qualified vehicle modifiers," to install CNG/LPG fuel systems. Ford will honor the engine warranty for a system installed by one of the six companies. Ford estimates conversions cost between $8,000 and $11,000 per vehicle depending on the size of the fuel tank. Ford's estimate of a 24-36 month payback period is based on the difference between the price of natural gas and the price of regular gasoline. This week the average price of a gallon of CNG was $2.06 compared with $3.67 for gasoline and $3.88 for diesel, according to cngnow.com, a Web site that gathers information from stations selling CNG and fuel price data from the U.S. Energy Administration. Ford said it is on pace to sell more than 15,000 CNG/LPG-prepped vehicles in 2013, an increase of 25 percent from 2012. Ford began offering natural gas conversion to customers in 2009 with the E-series van and has since added Super Duty pickups, the Transit Connect, several medium-duty trucks and now the F-150 to the list. Adding the F-150 brings Ford's biggest selling vehicle into the fold.